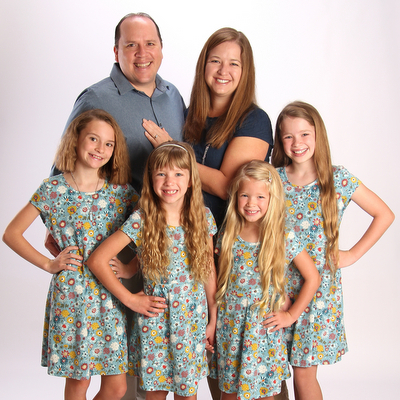 David and Ashley Ellingson are currently building a prayer and financial support team as they prepare to become missionaries to the island nation of Madagascar. God has richly blessed them with four daughters: Isabella (June 2010), Lydia (June 2011), Anna (April 2013), and Clara (January 2015). 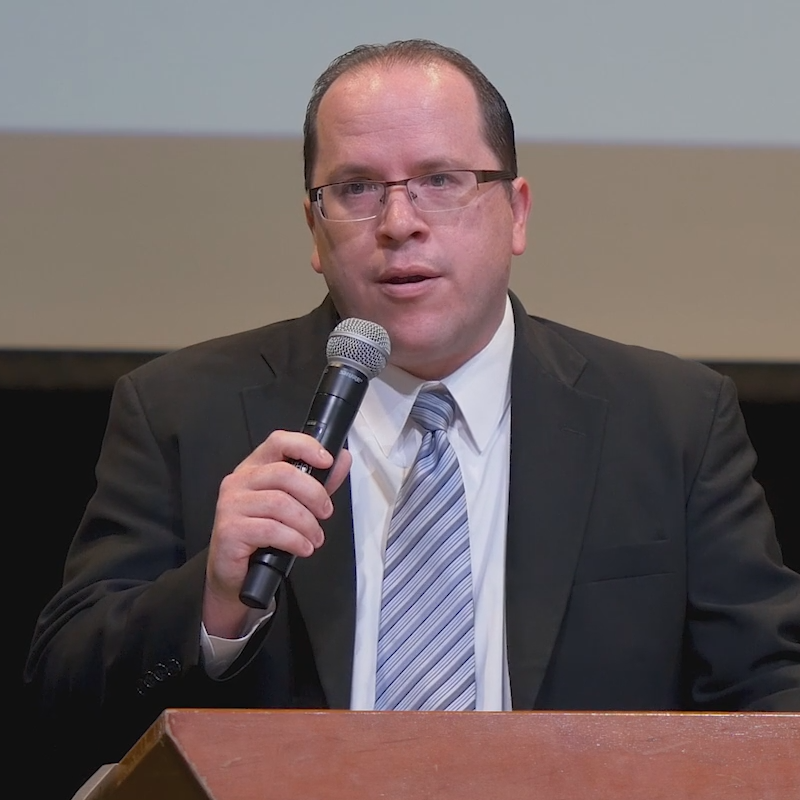 If the Lord wills and their support team is in place, they plan to leave for the mission field by the summer of 2019. You can partner financially with us at the bottom of this page. You can sign-up for our newsletters or view previous ones too. There are parts of Madagascar where the Malagasy people have never heard of Jesus Christ because they are so isolated. Ashley is working toward a biblical counseling certification through the Association of Certified Biblical Counselors (ACBC). She has taken all three Biblical Counseling courses and is now working to complete the 50 supervised counseling sessions. During our trip to Madagascar in August 2017, we learned that daily life in Madagascar would be difficult for us—especially if we moved to the country without any way to communicate. As you know, we will need to learn two languages—both French and Malagasy. Therefore, to make the transition more successful, we are planning to learn French before we go to Madagascar. On our way to Madagascar, we plan to attend a highly-rated French language school in Albertville, France to immerse us in French during the one-year program. This is a Christian-run program which has trained many missionaries. One key benefit to this program is that we will also learn some biblical and theological terminology in French—which will be very useful for future ministry. Visit Ministry2Madagascar.com for more information, photos, and prayer requests. Make a one-time or recurring credit card donation by filling out the form below. Type in an amount to give, select either "One Time" or "Monthly", then click the “+ Add to Giving” button, then on the next screen you can either create a new account or sign-in with your existing gracechurch.org account. Enter your credit card billing information, then click the “Submit Payment” button. Thank you! To set up a monthly direct deposit, print this form and follow its instructions (Use missionary/project: "Ellingson – Madagascar, #080507"). GMI Direct Deposit benefits you because there is no check writing, no postage costs, easy to track donations, and it's easy to start, change, or stop. This method benefits us as missionaries because donations do not get delayed, lost in the mail, or accidentally forgotten. Since credit cards expire, donations can stop unexpectedly. But direct deposits stabilize our support and allow us to stay focused on ministry. 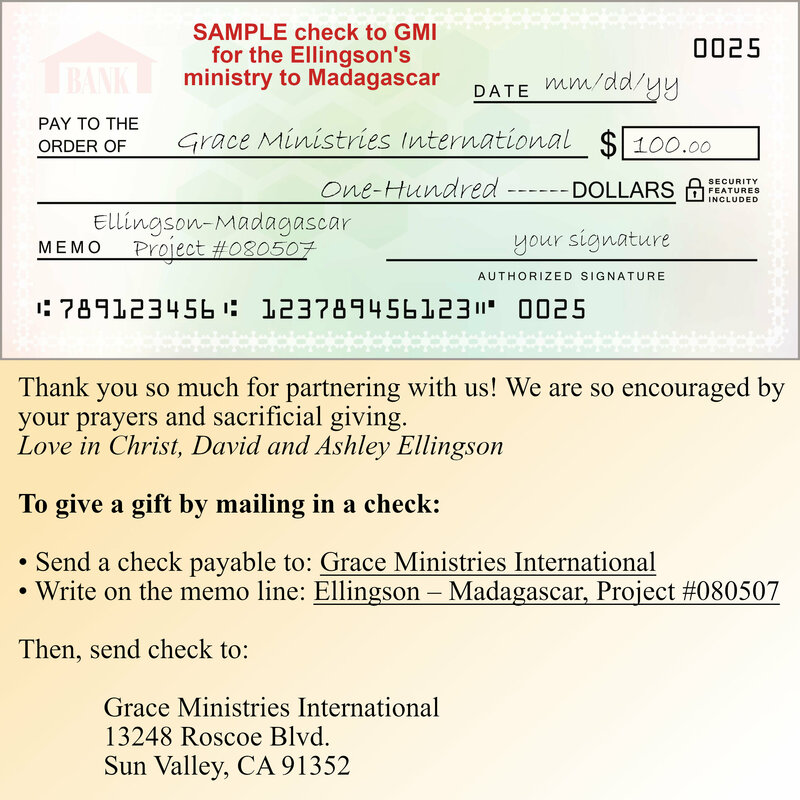 Contact your bank and set up an online monthly payment to "Grace Ministries International", 13248 Roscoe Blvd, Sun Valley, CA 91352 - be sure to include "Ellingson - Madagascar" in the memo or reference field.